Reduce your plastic footprint on the planet with our durable, reusable, set of 4 polished stainless steel drinking straws. 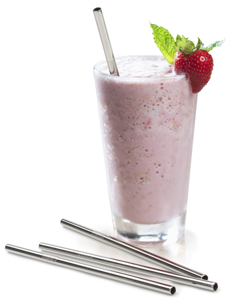 The 8 ½” long size and bigger diameter make them perfect for fruit smoothies, milkshakes, and floats. Although the straws are dishwasher safe, more thorough cleaning can be accomplished with our straw and nozzle brush. 7 mm wide, almost 9/32", a bit over 1/4"
Just wide enough for smoothies. I clean them immediately so it's not a big deal and I don't have to worry about rust. Not to stop shakes but to keep them comming. The straws stay cold so it seems to give it more of the old soda shop effect. These are all I use when having a Malt or Shake. The stainless steel straw is perfect for those who have extra long mustaches and beards and likes to drink hot coffee without getting it all over them and their guitar. All it takes is a good stainless steel 16oz mug with an opening that the straw can go through. THERMOS makes those mugs.